Sale 1948, 19TH & 20TH CENTURY LITERATURE SWANN GALLERIES, INC. LINKS TO INSCRIPTIONS by ERB "To Hulbert with love and best wishes. O.B. Tarzana September 20 1937." "To Robert Davis Esq. God father of Tarzan with best ever from Edgar Rice Burroughs. Oak Park May 1 1916." "Dear Hulbert - Wishing you the best of every thing. O. B. December 24 1940." "with love . . . Papa ~Tarzana Feb 14 1938." 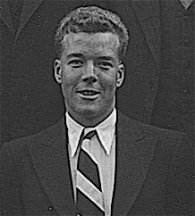 "With love, Ed Apr 9 1948." 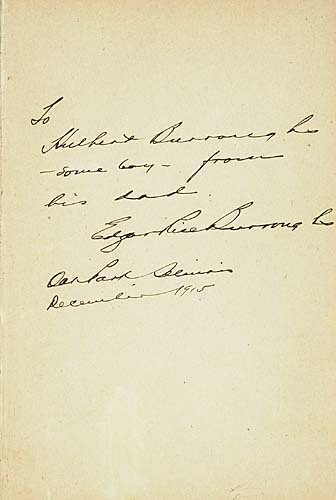 "To Charles McEntree with best wishes for the holidays and the future from his nephew Edgar Rice Burroughs. Tarzana Ranch Dec 25 1926." "To Emma, This, the 28th example of English as she is written by Ed. Tarzana March 7th 1928." "With all my love to my dear wife. Edgar Rice Burroughs Los Angeles April 22, 1926"
"Papa," to Hulbert: "with a great deal of love. Tarzana Ranch Nov 21, 1921"
"To my good friend Bob Davis, godfather of the Son of Tarzan, who is largely to blame for this story. Edgar Rice Burroughs. Oak Park Sept 17 1917"
"To Robert H. Davis, Esq. New York City." "Having just won a quarter from your husband, I am too excited to think of anything brilliant. Yours, Edgar Rice Burroughs. Tarzana Ranch Aug 6 1923." "To Hulbert Burroughs - some boy - from his dad. Edgar Rice Burroughs. Oak Park, Illinois December 1915." "Joe Neebe with best wishes." 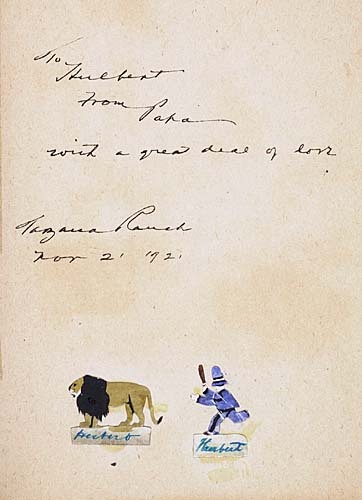 "To F. Coleman Burroughs with love from his brother Ed (alias Edgar Rice Burroughs) Tarzana Sep 19 1921." 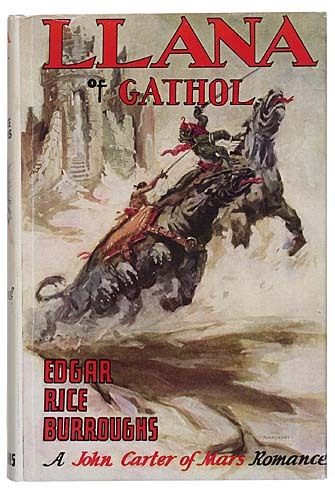 "To Hulbert, Prince of Tarzana from John Carter, War Lord of Mars and Edgar Rice Burroughs. Helium Jan 24 1921." 8vo, bright blue cloth stamped in bright red, near fine; dust jacket, laminated at a later date. "To Hulbert with love and best wishes. O.B. Tarzana September 20 1937." O.B. stands for "Old Burroughs"- the nickname his children gave him. "TO THE GODFATHER OF TARZAN" BURROUGHS, EDGAR RICE. The Beasts of Tarzan. reprint dust jacket, rubbed along spine ends and tips. Davis, All-Story Weekly editor "discovered" Burroughs, publishing Tarzan's original 1912 appearance and accepting Tarzan of the Apes for publication. SALESMAN'S DUMMY BURROUGHS, EDGAR RICE. The Beasts of Tarzan. Salesman's dummy. stamped "Dummy" on bottom edge. The contents are as follows: no half-title, title-page plain except for McClurg acorn device/copyright identical, followed by first 3 pages of Chapter 1, plate found on page , plate found on page , and plate found of page 34 of published edition. The Deputy Sheriff of Comanche County. barely affecting lettering, other minor surface wear. "Dear Hulbert- Wishing you the best of every thing. O. B. December 24 1940." Frontispiece by J. Allen St. John. 8vo, sky blue cloth stamped in black, minor rubbing. Inscribed and signed by Burroughs from Tarzana, September 10, 1928. Printer's booklet containing progressive proofs for the dust jacket design by Hugh Hutton. Oblong 4to, drab grey printed wrappers, folded, soiled; envelope with (printer's?) writing. Single full color dust jacket proof of front and spine panel of Synthetic Men of Mars. Folded, margin beginning to tear. Picturized from the Novel "Tarzan of the Apes" by Edgar Rice Burroughs. 300 illustrations by Harold Foster. dust jacket, early tape reinforcements around all edges, folds, and spine. First edition in beautiful boards. The early tape reinforcements were most likely by Hulbert. Although there is no indication of provenance on the title, a number of books in this collection were once owned by him. It is known that he had the unfortunate habit of protecting his books in this manner. 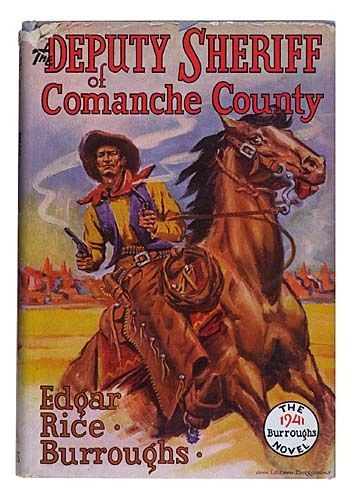 plus owner Maurice G. Gardner's clipped and tipped-in illustrations from the story's first appearance in Blue Book Magazine and others, including the front panel of the original dust jacket (yes, it's true). Gardner's pencil comments on preliminaries as well. First edition. inscribed and signed by burroughs to novelist Maurice B. Gardner from Tarzana May 31, 1932. Gardner's "personalizing" of the book includes his accession date of June 6, 1932, the dates of its first magazine appearance under the title "The Land of Hidden Men," and the dates written and published. (can be removed); soil mark to pages 296/297. Inscribed and signed by Burroughs on front endpaper. dust jacket, ½-inch chip at head of spine panel just affecting "L" of Lad, small chips at tips and other extremities rubbed with a few minor tears. Inscribed and signed "papa" by Burroughs to daughter, Joan on front endpaper. "with love . . .Tarzana Feb 14 1938." Joan Burroughs married Jim Pierce, one of the pre-Johnny Weissmuller Tarzans. Although not a screaming success on film, he and Joan became the stars of the Tarzan radio series written and produced by Edgar Rice Burroughs, Inc.
Sold to broadcasters around the country, it became the first packaged serial. LAST WORK BURROUGHS, EDGAR RICE. Llana of Gathol. 8vo, bright blue cloth lettered in red, bright and clean; crisp dust jacket. Inscribed to Hulbert and wife Marion "With love, Ed Apr 9 1948." 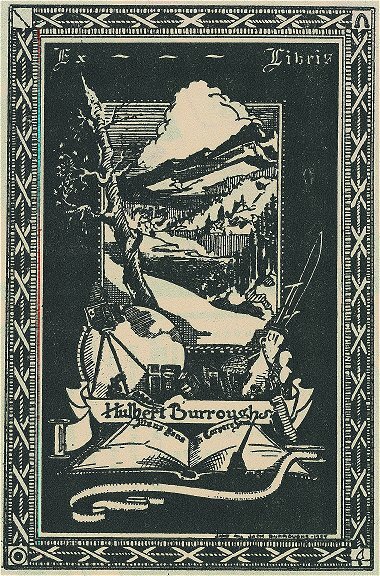 Hulbert's bookplate is also laid into the volume. Lana was his last book and the inscription is written in a shaky hand. Lot 53TO HIS FAVORITE UNCLE ON CHRISTMAS BURROUGHS, EDGAR RICE. The Mad King. Frontispiece by Allen St. John. title-page reinforced with visible white along outer edges of page. First edition, first state. inscribed and signed by burroughs to his favorite uncle. 8vo, orange cloth stamped in black, bright and clean. AND ANOTHER BURROUGHS, EDGAR RICE. The Moon Maid. 8vo, blue cloth stamped in black, minor rubbing. and beneath it again, "To Emma Hulbert Burroughs." 8vo, sea green cloth stamped in brick red, spine ends and tips rubbed with loss, backstrip a bit loose with rear joint starting, few light soil marks; hinges reinforced. "with a great deal of love. Tarzana Ranch Nov 21, 1921"
and with two original colored cartoons by burroughs of a lion and another of a cop running after it, waving his billy club, each with "Herbert" written below. this is the first appearance of the complete text comprising The Mucker and The Return of the Mucker. A charming and unique Burroughs piece. BURROUGHS, EDGAR RICE. The Oakdale Affair [and] The Rider. 8vo, bright blue cloth stamped in red; dust jacket, early lamination on recto, cleanly peeling away in many areas, scattered creasing and light edgewear, mostly at top, with some slight loss at corners of spine panel and folds. First edition. inscribed and signed by Burroughs to Russel van der Clock. A typed letter Signed by Science Fiction specialist Gery de la Ree describes van der Clock as a sci fi collector/fan who concentrated on Burroughs and Abraham Merritt, and who was building up stock to become a book dealer. De la Ree bought the collection after van der Clock's death in 1967. BURROUGHES, EDGAR RICE. The Oakdale Affair [and] The Rider. Printer's booklet containing progressive proofs for the dust jacket design by John Coleman Burroughs for the First American Edition. Oblong 4to, stapled plain printed brown wrappers, folded. 8vo, gilt-lettered red cloth, lightly soiled, spine a bit dulled; owner's ink stamp on rear free endpaper. First edition. inscibed and signed by Burroughs from Los Angeles in the year of publication. splits between some gatherings, scattered soiling. Sheet signed "Yours, Edgar Rice Burroughs" tipped to title-page. BURROUGHS, EDGAR RICE. The Son of Tarzan. Plates and illustrations by J. Allen St. John. facsimile dust jacket. W. F. Hall on base of copyright and with the dedication page to Hulbert present. and again, beneath it: "To Robert H. Davis, Esq. New York City." other moderate creasing and chipping along edges. Illustrated with scenes from the film. dust jacket, scattered chipping and creasing with some loss to tips and ends of spine panel, some dampstaining and tape repairs on verso. Alexander Grosset, and George Dunlap (publishers). As a thoughtful pet project, Burroughs gathered 25 copies, had each contributor to the project sign the endpaper, then kindly gifted a completed copy to each of them. It remains the only known signed edition by Photoplay or Burroughs, and was unknown to Heins at the time he published his bibliography on Burroughs in 1964.
scattered light soiling, endpapers toned; bookplate. BURROUGHS, EDGAR RICE. Tarzan of the Air: A Program with a Readymade Audience. 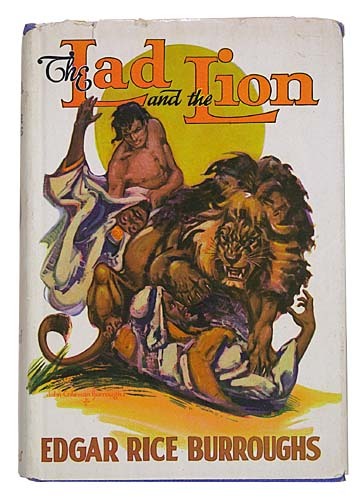 With the J. Allen St. John dust jacket cover from Tarzan and the City of Gold on front cover. Fine in original mailing envelope. Promotional pamphlet for the Tarzan Radio Program, boasting the remarkable results of such sponsors as Signal Oil and Gas Co., Reed Tobacco Co., Royal Baking Co., Freihofer Baking Co. and others. A fun piece of Burroughs ephemera. THE BOOK THAT STARTED IT ALL BURROUGHS, EDGAR RICE. Tarzan of the Apes. Old English type on copyright. All-Story Magazine first printed Tarzan of the Apes 90 years ago this month in its October 1912 issue. Immediately popular, it was reprinted in several other newspapers. It was only through Burroughs's own perseverance that the book was published in cloth two years later. 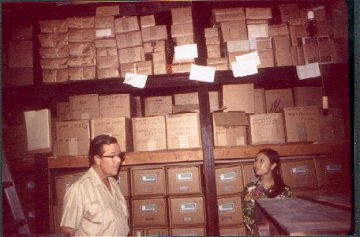 Every day for several months the author would come into the retail store that McClurg kept in Chicago and report Tarzan's mounting popularity in the States and England to the head of publications (or, apparently, anyone else who would listen). His relentless campaign finally convinced them to print about 2000 copies. It was so successful that additional copies were printed at a nearby jobber who employed the acorn device on the spine once believed to indicate the first issue. 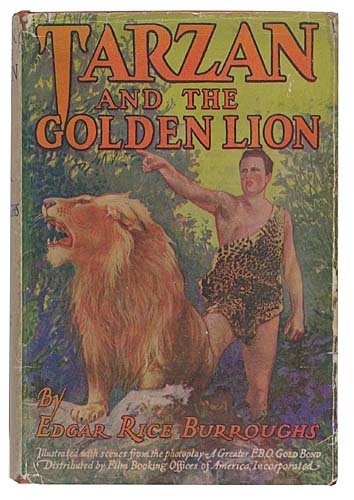 THE BURROUGHS-HULBERT COPY OF TARZAN BURROUGHS, EDGAR RICE. Tarzan of the Apes. First issue with printer set in two lines in Old English type on copyright page, rear hinge reinforced with cellotape, front hinge professionally repaired, small split between pages 4 and 5, occassional crease or faint dampstain to upper outer margins. An extremely desirable copy of the book that gave birth to the Tarzan phenomenon and launched Burroughs's great fame, warmly inscribed and signed to his own son. BURROUGHS, EDGAR RICE. Tarzan the Terrible. 8vo, red cloth stamped in black, minor rubbing with some slight loss of color. First edition. inscribed and signed by Burroughs to Joe Neebe "with best wishes." 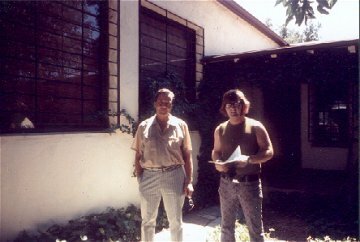 Neebe worked with Burroughs in establishing the Tarzan comic strip and radio show. page 383/84 with 2-inch clean tear, endpapers toned. A WARM INSCRIPTION SIGNED FROM HELIUM BURROUGHS, EDGAR RICE. endpapers a bit toned, hinges and rear pastedown professionally repaired. 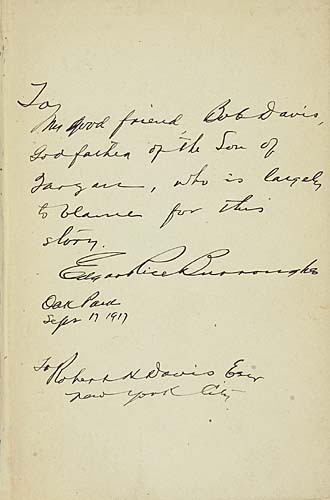 A wonderful personal inscription signed from E.R.B. 's fictional utopian city. BURROUGHS, EDGAR RICE. Original copper plate for The Chessmen of Mars. "Ghek in his happier days third foreman of the fields, sat nursing his anger and his humiliation." FOR ETA ABS AND ZAS BURROUGHS, EDGAR RICE. Official Guide of the Tarzan Clans of America. 8vo, original pictorial orange wrappers by John Coleman Burroughs. Available only to members of the Tarzan Clan. The membership fee of one dollar included this guide, a membership card, and a signed Burroughs first edition. instructions on how to make a spear (padded tips only!). with -- The Dream Weaver: An Edgar Rice Burroughs Chapbook. One of 250 copies printed by Alvin Fick of Pinion Private Press.